You likely have seen a low LASIK price or heard a LASIK ad with offers as low as $99. Offers such as these may sound too good to be true and leave you feeling confused and uneasy. You may be charged for the initial consultation—a service that is provided for free at the majority of LASIK practices. 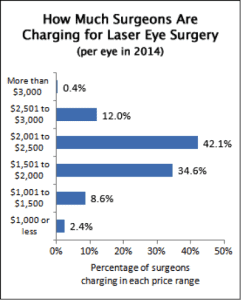 The LASIK price may not include pre- and post-LASIK visits. Additionally, if there is a problem that requires additional care, it could cost you extra. You should know that many LASIK providers offer pricing that covers full follow up care, regardless of circumstances, and goes so far as to include enhancement or retreatment surgeries if needed to ensure you achieve your vision goals. So, if you’re considering LASIK, make sure you get a written cost estimate that itemizes everything in the offer. Read the fine print, and ask about all potential extra fees before going ahead with the procedure. Typically, only those with very simple prescriptions (low nearsightedness) and vision correction requirements are eligible for the most basic, and least expensive, of LASIK procedures – called conventional LASIK. Generally, farsighted people and those with astigmatism aren’t good candidates for conventional LASIK. So while you will see advertisements for a very low LASIK price, most LASIK patients will wind up paying more. This isn’t necessarily bad—as we discussed earlier—some people are suited to conventional LASIK. However, today’s modern LASIK offers the potential for a more precise LASIK procedure, with less risk of complications. These newer technologies include the very popular custom LASIK procedure, where a wavefront and/or topographical analysis of your eyes is performed prior to your procedure to create a vision correction treatment specifically for your eyes and vision. There is also a blade-free option in LASIK that replaces the microkeratome blade with a laser for creating a flap in the cornea in the first step in the procedure. You shouldn’t expect these advancements to be covered in a $99 LASIK price tag. The national average price—per eye—for LASIK today is around $2,500. It is important to remember that LASIK is an investment in your healthy, active lifestyle with excellent vision. While it is natural to want to get a good deal, the decision to have LASIK shouldn’t be based solely on price. You want the best-qualified surgeon and technology to help ensure you achieve your vision correction goals and while those can be affordable, they don’t come cheap. "After having to wear contacts for 20 years, I knew it was time to throw them away when I became a firefighter. I now wake up to respond to an alarm with clear vision and I don't have to worry about my eyes. It truly was an amazing and life changing experience."